A memory card, flash card or SD card is an electronic memory data storage device used for storing digital information. These cards are designed to be small, portable as well as its ample storage space. It can help users store as much as personal files such as pictures, videos, music files, documents, etc. However, the files might be lost due to various reasons such as accidental deletion, formatting, virus attack. When you encountered an unexpected data loss disaster on your memory card, you would need a reliable best-deleted file recovery software for a memory card to restore your data. But which one is the best choice? 1) Security, 2) Quality, 3) Ease of use, 4), Compatibility, and 5), Technical support. Conclude: we recommend you Bitwar Data Recovery to help you fully recover deleted or lost files from memory card. It is very secure and does not bind any processes. You have supported all file types and storage devices. When the scan process is over, the program should be able to allow users to preview thumbnails of found files, because this helps you to quickly check if they are the items you want to bring back. The software interface is simple and easy to use. And it Supported OS: Windows 10/8/7/XP/Vista, Mac OS X (Mac OS X 10.6, 10.7 and 10.8, 10.9, 10.10 Yosemite, 10.10, 10.11 El Capitan, 10.12 Sierra) on iMac, MacBook, Mac Pro, etc. How to recover deleted file from memory card? 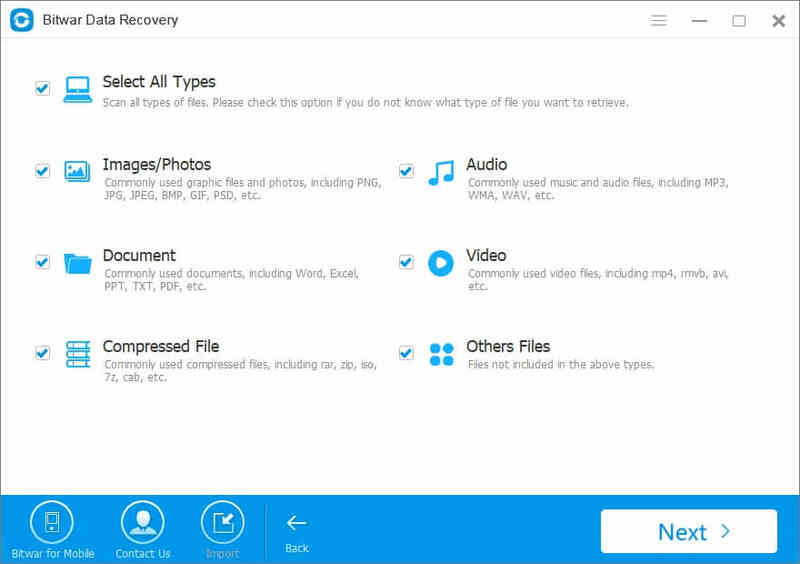 You can download and install Bitwar Data Recovery and try the guide below to recover permanently deleted files/folder in Windows 10/8/7/XP/Vista with simple steps. Connect the memory card to the computer and select it on this program, then click "Next." Select the types of deleted files then click on the button "Next" . The Bitwar Data Recovery supports all file types: pictures, videos, audio, emails, documents and others. After the scan is complete, you can find the files which you deleted from the memory card. Bitwar Data Recovery supports previewing 300 of commonly used file types, You can preview them to make a selective recovery. When you find the deleted file or folder, click the "Recovery" button and save them to hard disk or other external device. Following this action, the deleted files from memory card have been recovered. Bitwar Data Recovery can recover deleted data from pretty much anything including laptops, desktops, USB drives, workstations, internal and external hard drives, memory cards, and more. ●Use a specific card for every device. ●Be careful on memory card daily use - When you take the memory card out or put it back into digital devices, you must be very careful. Next：How to recover deleted files from memory card with Bitwar data recovery software?